click Here it is time for scans again. We didn’t manage to get post typed before we left for Boston (which I will explain later), but today we are in Boston for Emma’s routine three month scans. We are so very thankful and happy to report that Emma had good news today. We are told that her tumor remained stable and in some areas the tumor was smaller than in her last scan. We are so unbelievably thankful for this good news! These were our first scans that we have done in which she hasn’t had any chemo, so needless to say we were pretty nervous about what they would show. follow url It was a long day of appointments and scans, but things went well. Both the oncologist and neurologist were happy with Emma’s improvements. They were happy to see that she has made some nice gains in therapy since being off of chemo and that her appetite has continued to improve as well. Big thanks to all of her therapists who continue to work so hard with her so that she can continue to make progress. The doctor’s recommendations at this point are to continue with no chemo since the tumor is stable, to go ahead and remove her port, and continue working hard on therapy and her overall strength and development. 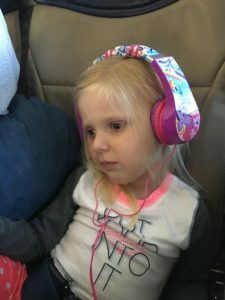 The psychologist recommends that we have a neuropsych evaluation done this summer since Emma will be old enough for the testing and will provide good information about her learning styles and abilities as she gets ready to go to Kindergarten. http://oldafricamagazine.com/?search=names-of-drugs-like-viagra Now for the reason we didn’t have time to get a post written last week to let you all know we were headed out here. Miss Emma thought we could use a little excitement last week and got herself admitted to Children’s in Omaha. 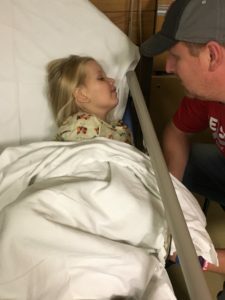 After about 5 days of feeling miserable and what we initially thought was constipation problems, we ended up in the ER. We were concerned because Emma refused to sit up because she had so much abdominal pain, and just felt rotten. 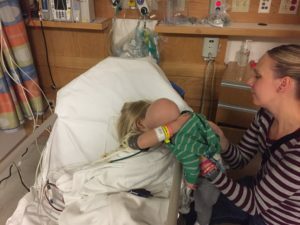 (Emma was admitted on Wednesday and was discharged Saturday afternoon, but after three days of being in the hospital, and mom needing to pack for our trip we didn’t have time to get the post written before we left.) After many, many tests they found Emma had a pretty severe UTI, as well as probably an infection in her kidneys and possibly abdomen. The CT of her abdomen showed that her left kidney is smaller than her right kidney and it has some scarring on it. At this point they aren’t sure what has caused this. They have some theories, but are going to do some additional tests in Omaha next week to try and figure out exactly what is going on. 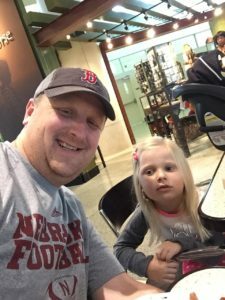 follow url How many 4 year olds do you know that can make it 6:30 a.m to 3:00 p.m. in an airport and plane without one behavior issue. She and her brother were awesome. http://sprucefoundation.org/?search=new-drug-better-than-viagra-and-natural&82c=db Here it is the end of September, which is childhood cancer awareness month. I’ve been meaning to write something about it all month, but I was having a hard time finding the right words. This is month where those of us who have been touched by this disease work hard to spread awareness and funding to help our kids. Unfortunately only 4% of the National Cancer Institute’s budget is given to pediatric cancer research. This just isn’t enough for our kids. Over the last three and half years we have met so many little fighters, and I have to say these kids are the strongest little people you will ever meet. Their strength and resilience as they endure treatments is simply remarkable. The hard truth of this though, is that we are still losing kids to these awful diseases and we need to find a cure. Our kids deserve better. The reality of childhood cancer awareness month for us and many other families is that we need no reminder to be aware of childhood cancer. Since diagnosis day it has consumed us and there is never a day that we are not aware of childhood cancer and the effects that it has on our child and our whole family. We are so painfully aware of how it has changed our lives. This however is the reason why we must fight. We must continue to fight for our kids, raise awareness, and raise funding so that some day there will be better treatments for our kids. Thank you to all of you who continue to join this fight and help to spread awareness and raise funding for kids. We as a family who has been impacted by this disease are so incredibly thankful for your support! discount viagra professional I can’t tell you how much we all, especially Emma, miss this little man. 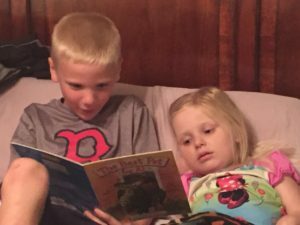 Here is a pic of Aiden reading to Emma on Monday before we left. go to site Finally, thank you to everyone for the messages and prayers today for good scans. Once again it is you prayers and support that help to get us through these hard days, and we are so thankful to have your support!